Relatively new to the sheet game, bedding brand Eli & Elm has already set out to make a lasting impression on the industry. In recent months, Eli & Elm has released three separate bedding collections — and guess what? Sleepopolis is about to test them all. In this review, we’ll be taking a close look at three sheet sets from Eli & Elm — the Cool Sheet Set from the Whitney Collection, the Bamboo Sheet Set from the Wharf Collection, and the Organic Cotton Sheet Set from the Ferry Collection. So, let’s examine what each sheet set is made of, how they compare, and which sleepers might be most compatible with which set! In need of new bedding and looking for a deal? Use the code SLEEPOPOLIS to save 15% on new sheets from Eli and Elm! 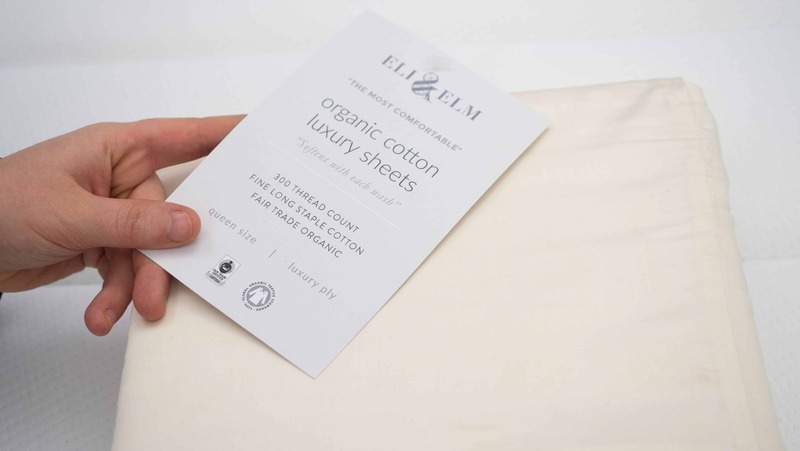 What Are Eli & Elm Sheets Made Of? Ready to unbox the Cool Sheet Set first! The Cool Sheet Set from Eli & Elm’s Whitney Collection is sateen woven into a 400 thread count, and made from a blend of long-staple cotton, lyocell, and phase change material. Now, the cotton is going to provide that classic, cozy and breathable feel that many of us have become familiar with — and the long-staples add some strong durability to the fabric. But, what about those other two ingredients? Well, lyocell is a cellulosic fiber made from dissolving wood pulp that often goes by its brand name, Tencel. It’s frequently featured in the world of bedding (and also in clothing), and it’s known for being super soft, wrinkle-resistant, and naturally moisture-wicking. And that ability to wick moisture is going to help the Cool Sheet Set stay… well… cool! Meanwhile, the phase change material is what takes the cooling properties of this sheet set to the next level. Some of you may remember phase change material from my Bear pillow review but, essentially, it’s a technology within textile manufacturing that offers thermo-regulating properties. In this case, paraffin plant oil is the main ingredient in Eli & Elm’s PCM, and it’s intended to offer an icy-crisp feel that’s notably cool to the touch. Each sheet set comes with two pillowcases, one top sheet, and one fitted sheet able to accomodate mattresses up to 15 inches deep. So, for those of you with taller mattresses, these sheets should fit your bed just fine (as long as it’s fewer than 15 inches!). On to the Bamboo Sheet Set! The Bamboo Sheet Set from Eli & Elm’s Wharf collection is made from 100% viscose from bamboo, and woven into a 300 thread count. So, this bedding offers a totally different feel as compared to the Cool Sheet Set. There are many advantages to bamboo-based bedding including great durability, a soft and silky feel, as well as antimicrobial and moisture-wicking properties. Additionally, eco-friendly sleepers might like to know that bamboo is a sustainably sourced material, and it’s also hypoallergenic. Thanks to the light breathability of this bedding, these sheets are also quite cool. However, their cooling properties are more rooted in the fact that bamboo-based bedding often provides a silky, airy feel that helps dissipate the sleeper’s body heat. So, comparatively, Eli & Elm’s Cool Sheet Set feels cooler to the touch (because of the PCM), while the Bamboo Sheet Set feels more light and breezy. Each sheet set comes with two pillowcases, one top sheet, and one fitted sheet able to fit mattresses up to 15 inches deep! Moving onto the Organic Cotton Sheet Set! The Organic Cotton Sheet Set from Eli & Elm’s Ferry Collection is made from 100% organic long-staple cotton. 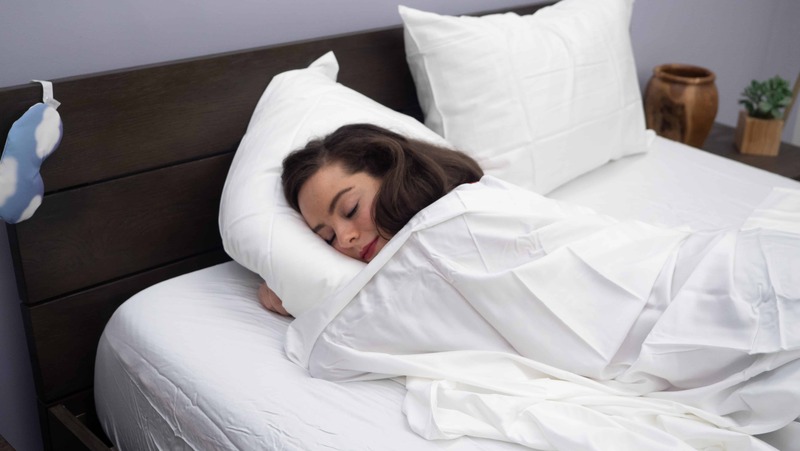 They are GOTS-certified which means no genetically modified cotton seeds, and no harsh dyes or chemicals were used in the making of this bedding. So, eco-friendly sleepers or folks with sensitive skin might be especially compatible with these sheets. Like the other two sheet sets, this set comes with two pillowcases, one top sheet, and one fitted sheet able to accomodate mattresses up to 15 inches deep.Now, because these sheets are woven from long-staple cotton, they’re going to be softer, less susceptible to fraying or pilling, and generally more durable as compared to cotton sheets woven from shorter fibers. In general, the length of the fiber is a better indicator of quality than thread count is. Thread count is not a negligible detail, but let’s put it this way — many bedding brands don’t even include thread count information anymore. Instead, the length of the fibers (commonly referred to as staples) is advertised front and center! That being said, these sheets have a thread count of 300, and feature a sateen weave. And the sateen weave offers a lustrous sheen and a silkier feel as compared to a percale weave. 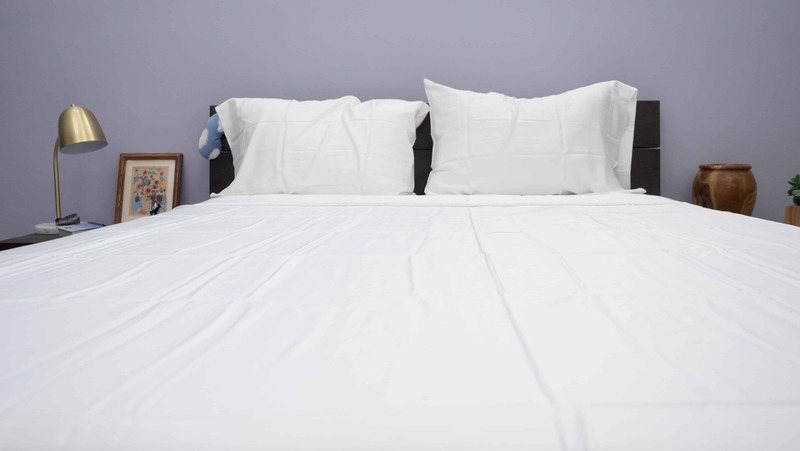 In general, sateen woven sheets are shinier, thicker, and less breathable. Of course, the only way to really know how a set of sheets performs is to test it for yourself! So, let’s take a look at how all three of these sheet sets feel. How Do Eli & Elm Sheets Feel? These sheets feel notably cool to the touch (thanks to the PCM). The phase change material gives these sheets a feel that’s more than just light and airy — they actually feel icy-crisp. Another interesting characteristic of the PCM is that it contributes to a crisp texture. The reason I say that’s interesting is because sheets are sateen woven, which typically yields a feel that’s silky as opposed to crisp. So, according to the folks at Eli & Elm, the PCM combines with the sateen weave to achieve the crisp feel of percale, and the silky, shiny nature of sateen. Enjoying the smooth crispness of the Cool Sheet Set! In addition to the cooling qualities of the PCM, the long-staple cotton combines with the lyocell in a way that makes these sheets feel smooth, durable, and breathable. So, you’re getting a very cozy combination of traits that create a light and breathable feel, but also provide strong durability. Perfect for: The hot sleeper who loves a cozy combination of crisp, smooth, and lustrous! On the other hand, the Bamboo Sheet Set offers its own set of cooling properties. Bamboo-based bedding has a reputation for being extra breathable — and these are no exception. So, the light, airy nature of these sheets is going to help keep the sleeper from warming up over the course of the night. However, this bedding does not feel cool to the touch in the way that the Cool Sheet Set does. Instead, it offers a breezy quality and a very silky handfeel. 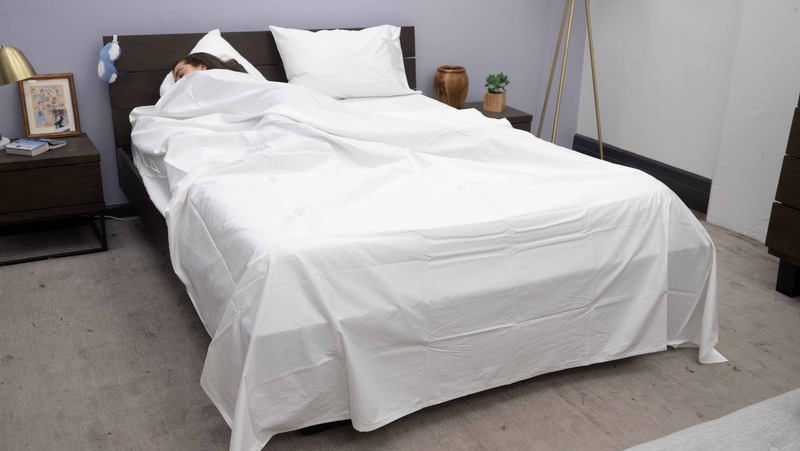 I would definitely say these sheets are still great for hot sleepers, but they just offer a more lustrous look and a lighter feel as compared to the Cool Sheet Set. Burrowing into the silky-smooth Bamboo Sheet Set! But don’t mistake this bedding’s light breathability for thinness. 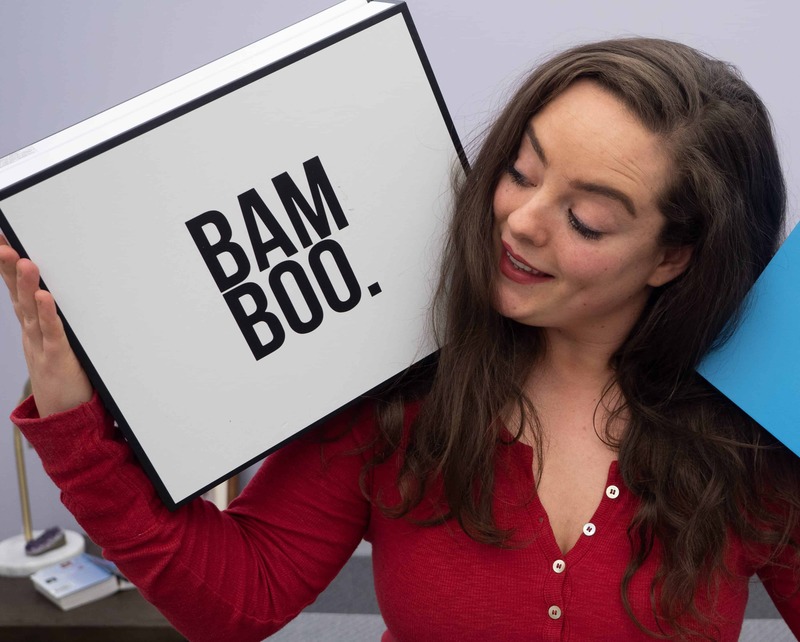 Bamboo-based sheets are notorious for being extra durable, and these sheets definitely feel like they’d last you a good, long while. Not to mention, their lustrous sheen and silky draping outlines your body’s shape in an elegantly cozy way. Perfect for: The eco-friendly sleeper who loves the light, silky breathability of bamboo-based bedding! Of all the Eli & Elm bedding we’re looking at here, these sheets offer the most classic cotton feel. The long-staple organic cotton offers that soft, cozy feel that many of us have become familiar with. However, the sateen weave takes the crispness down a notch, and boosts the smoothness instead. So, while these sheets do offer that signature, cozy-cotton feel, they do not feel very crisp. While these sheets are not heavy, they aren’t as breathable as the other two sheet sets. Often times, a sateen weave makes for a thicker, less breathable sheet (which can often detract from the cooling qualities). So, when I billowed these sheets over the mattress, I didn’t really feel the air flowing through the fabric, which lets me know that these sheets are going to be a bit more warm and cozy, and less cooling. So, of the three sets, I’d say these are the least cooling. This is not to say that they feel warming like flannel — but the sateen weave just has them feeling a bit less breathable. However, this weave style does bring some other great qualities to the bedroom. These sheets have a very pretty lustrous sheen, and a silky-smooth handfeel. Perfect for: Sateen-lovers who enjoy the cozy warmth of cotton combined with a luminous sheen! Are Eli & Elm Sheets Good, Sarah? In my experience testing these sheet sets, I found them all to bring their own special set of perks to the bedroom. Of course… I do have a favorite. 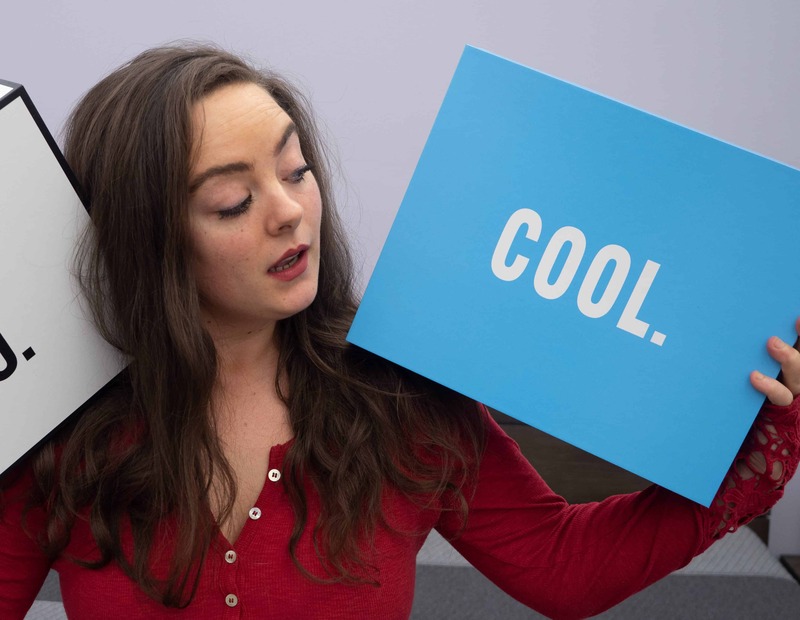 So, when I first unboxed the Cool Sheet Set, the first thing I thought was, “Oh, wow, they aren’t kidding!” These sheets are so cool to the touch — it kind of felt like they had been refrigerated for a while. So, as a perpetually hot sleeper, I could definitely see myself enjoying this sheet set all year long. I also really enjoyed the unique blending of percale and sateen characteristics. 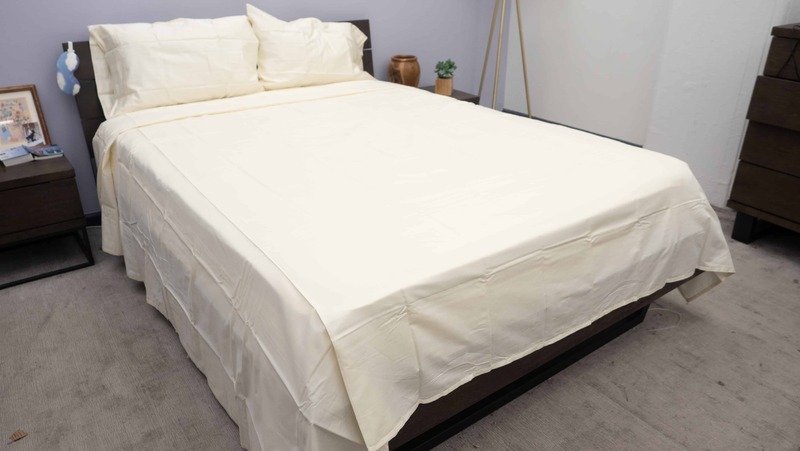 These sheets are sateen woven, which keeps them feeling very smooth; but the PCM brings a crispness to the table that I thought took the comfort factor to the next level. So, sleepers who love the cool crispness of percale, but also love the smooth draping of sateen — these sheets kind of bring you the best of both worlds. Keeping cool under the Cool Sheet Set. Meanwhile, the Bamboo Sheet Set, in my opinion, is the most aesthetically pleasing. Don’t get me wrong — I found their silky-softness and light breathability to be incredibly comforting. But what really made this sheet set stand out, to me, is its lustrous sheen. The combination of this bedding’s airy lightness, silky feel, and luminous shine offer a very pretty drape over the mattress that, in my opinion, boosted the whole look of the bedroom. Not to mention, the breathability of bamboo-based bedding is usually a sure-fire way to help keep me cool. So, while the Bamboo Sheet Set wasn’t as immediately cool to the touch as the Cool Sheet Set, I still got a pretty good sense that it would sleep cool. The Bamboo Sheet Set draping over the mattress. As far as the Organic Cotton Sheet Set is concerned, I enjoyed the cozy, cotton feel. I also sleep easier knowing that the cotton is certified organic and also a product of Fair Trade manufacturing. So, if you love the soft feel of long-staple cotton sheets and ethically sourced bedding is an important factor for you — this sheet set might be right up your alley. I will say, however, that these sheets were a little less breathable than I was hoping they’d be. They are sateen woven, so I know that this weave style tends to be less breathable than percale woven sheets. However, I actually felt that these sheets were a bit too warming. So, for me, I might only break this bedding out in the cooler climates. The Organic Cotton Sheet Set. Overall, I was most impressed by the Cool Sheet Set. Like I said, I found each sheet set to be beneficial in its own way — but the Cool Sheet Set offers a rather unique blending of characteristics. The cotton-lyocell-PCM combination leaves these sheets feeling soft, crisp, smooth, and icy-cool all at the same time. Well done, Eli & Elm! The Verdict: Both the Bamboo and the Cool Sheet Sets are going to be great picks for sleepers who run hot. The Cool set is more crisp, and the Bamboo set is more silky. Meanwhile, the Organic Cotton Sheet Set is best for the sateen-lover who likes to burrow into warm, cozy bedding. Should I Buy Eli & Elm Sheets? Alright, let’s recap all of this bedding’s highlights one more time so you can decide which of these sheet sets is best for you! Sleeps Cool – Of the three sheet sets, these sleep the coolest. Crisp & Silky – This bedding’s blending of materials creates a feel that’s both crisp and silky-smooth. Lustrous – The sateen weave offers a pretty, luminous sheen. Eco-friendly – Bamboo is a sustainably sourced material. Silky-Smooth – The bamboo gives this bedding a very silky, smooth feel. Lustrous – These sheets have a light, lustrous sheen that enhances the drape over your body in an aesthetically pleasing way! Ethically Sourced – This cotton is certified organic, and a product of Fair Trade manufacturing. Smooth Handfeel – Cotton sateen gives this bedding a feel that’s very smooth and comforting. Sateen Sheen – Folks who love that signature sateen sheen will likely love the look of these sheets! So, there are a couple things about each of these sheet sets that some sleepers might consider to be drawbacks. Always Cool – Thanks to the PCM, these sheets are designed to stay cool all night long. So, if you’re looking for sheets that warm you up – I’d look elsewhere! Sizing – These sheets only come in Queen, King, and Cali King sizes. Wrinkly – Bamboo-based bedding has a reputation for being extra prone to wrinkling, and these are no exception! However, sleepers can choose to iron these sheets on a low setting for a wrinkle-free look. Slippery – The very silky feel of these sheets makes them a bit slippery so, in my experience, it’s easier for the top sheet to slip off the mattress. 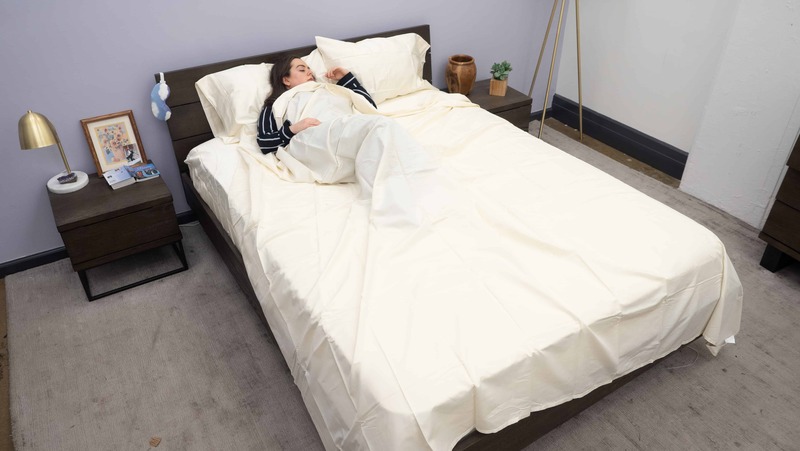 Less Breathable – A sateen weave often makes bedding less breathable, and I found that to be the case with these sheets. Not Crisp – Sleepers who prefer a crisp cotton feel might be more compatible with a percale woven sheet set. Wash Care — All of these sheet sets should be washed in a cold, gentle cycle, and then left to tumble dry on low heat. They can all be ironed, but on a low setting. 45 Day Trial Period – Not sure these sheet sets are right for you? You have 45 days to test them out! Eli & Elm asks that you wait two weeks before making a decision, but if after two weeks, you’re sure you don’t love them, you will be fully refunded. Duvet Cover — A matching duvet cover for the Organic Cotton Sheet Set is available for purchase in the Ferry Collection. Shipping — These sheet sets ship to the lower 48 states for free, however, shipping to Alaska and Hawaii is $45 per set. Canada — Shipping costs $45 per set.